It’s the holiday season, and the baking and cooking frenzy has begun. Cooking is not my thing. I tend to swear a lot when I have to prepare large meals. My Italian friend keeps telling me that cooking is relaxing. I haven’t experienced that yet. I used to dust my stove. I’m trying new recipes lately, so that’s progress. I do have history of bad kitchen experiences…I had to go to the hospital once for stitches because of a cooking accident. I dropped a glass mixing bowl on my foot. Another time, I put a glass container with au gratin potatoes on the stove top. It exploded, and we found shards of glass and cheesy potatoes in the strangest places. I spilled beef broth from the crock pot down my front, and got a nice burn. In the early years, the smoke detector served as our dinner bell. I can’t tell you how many things I burned, charred, or set fire to. And yes, it is possible to set fire to a no-bake recipe. I was making an éclair pie, and the last step is to ice the graham crackers with chocolate frosting. It makes a big mess if the icing in solid, so I put the container in the microwave for a few minutes to melt it. I put a paper towel over it to prevent any spatter. Well, this time, the canister turned into a volcano, spewing chocolate lava down the sides. The next thing I knew, the paper towel caught fire. What a mess. We acquired an InstantPot recently. (It didn’t fall off of a truck. My husband went to an unclaimed freight auction, and it was in one of the boxes.) We made baked potatoes in it in 15 minutes. Awesome! It’s my new, favorite thing. I have to admit that I was a little leery at first. My grandmother had a 1970s pressure cooker, and the release valve blew off and hit the ceiling once. 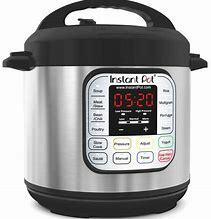 But there was nothing to fear with the InstantPot. It worked as advertised. Now I’m looking for good recipes to try in it. Let me know if you have any good suggestions. Kelly Justice, from Fountain Books, sent me two good cookbook suggestions to try. What are some of your favorites?